View the full list of Alor Setar ETS Fares for the new high-speed trains (Electric Train Services) that have replaced the older diesel Express trains on the north -south railway line in Peninsular Malaysia. ETS Trains currently run to the Thailand border at Padang Besar to the north. To Gemas in the south (where the dual track has yet to be completed). From Gemas you have to change trains to continue your journey further south, with Shuttle Trains services operating to JB Sentral in Johor Bahru, then another Shuttle Train over the Causeway to Woodlands in Singapore. 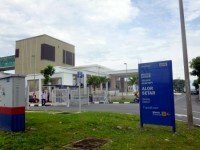 Alor Setar Railway Station in Kedah receives two types of ETS Train Services. ETS Platinum Services which are the fastest and most expensive trains. ETS Gold Services which are slightly slower, but cheaper, stopping off at more of the smaller stations along the route. All ETS ticket prices in the table below are in Malaysian Ringgit (MYR). Child fares shown in the table above are for kids aged between 4 to 12 years old. Children below 4 are not required to purchase a ticket. If you are travel from A. Setar to Langkawi Island you can take a local bus to the jetty at Kuala Kedah. Buying ETS Train tickets in Malaysia is very easy.